With the advent of warmer weather, at least here, I have started working on my garden. The sugar snaps are starting to come up. 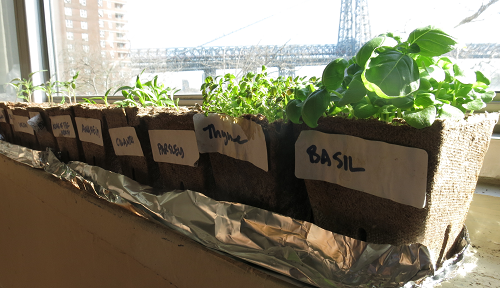 Spinach and arugula are coming up. Waiting to see if the radishes and nasturtiums make it. I''m trying to practice patience for tomatoes, squash, and the rest of the warmer weather crops. our backyard is still covered by about 2 feet of snow. Only two feet spring truly has sprung. It will be more than 2 months before I can even consider planting anything at all. Anything planted before the end of May risks being killed by frost. The last of the snow was gone this weekend, crocuses I planted last fall have started blooming. I just clipped back some hedges, the roses, perennials...first application of fertiliser. we praise global warming every day. Lots of garlic is apparently what you get If you leave your herb and vegetable containers unattended for four nyc winters. The squirrel decimated much of what N was growing over the winter. However, it didn't touch what was on the porch, so the Meyer lemon tree has yielded quite a bit of fruit. Unfortunately, our HOA is planning to replace all of the exterior siding on our building starting on Monday, so N will have to rearrange the plants and move some of them inside. Plus, once we move, she'll have to figure out where she can put the current plants and what she can plant new. Progressing apace. The tricky thing is to time the plants so that the warm weather arrives before they get too big to keep indoors. I've never gotten it right yet, but hope springs eternal. This winter (for plants) may be eternal. P.S. Nice East River (or Willy B) view, from East River. My love of the river view slightly outweighs my hatred of being so far from the subway. Slightly. Last snow of the season. Right. Sounds like when I comment, "Traffic really has been light today" a mile before we hit bumper to bumper commute hour. N's plants have taken a beating over the last few months, between the rat, the squirrels, and having to move the plants in and out (and board some of them) due to the exterior siding work. We're really, really hoping for some decent gardening space in whatever new home we get. There'll be a subway nearer to you in 2050 or so.